One of the most celebrated generals of the 20th century, Norman Schwarzkopf, is being lauded by presidents and military leaders as a true patriot. NBC's Andrea Mitchell reports. 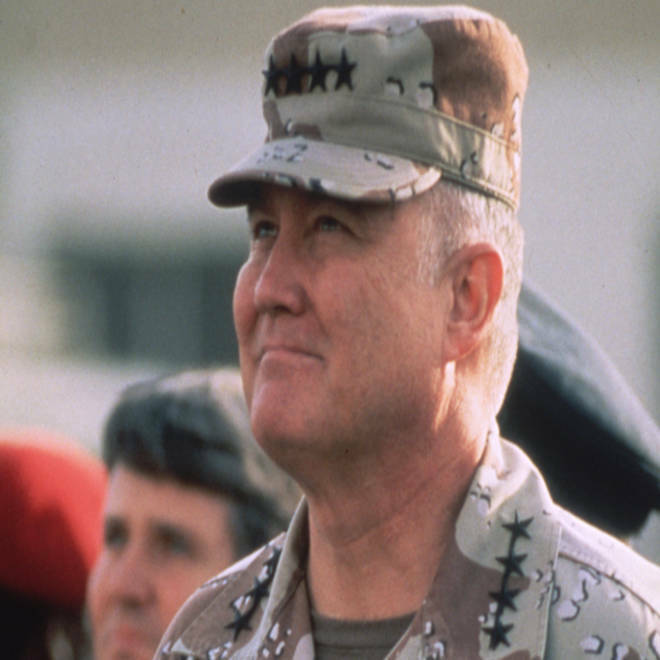 Retired Gen. Norman Schwarzkopf, the blunt, bulldog-like commander of U.S.-led coalition forces in the first Persian Gulf War, died Thursday in Florida. He was 78. Schwarzkopf died from complications of pneumonia after a long illness at his home in Tampa, where he lived in retirement. Schwarzkopf, a highly decorated Vietnam War veteran who rose quickly through the Army's ranks during the 1970s and '80s, drew up the initial plans for the successful U.S.-led ejection of Saddam Hussein's forces from Kuwait, which Iraq invaded in 1990. He then became famous for his pointed and inventive language during the almost-daily televised briefings he gave reporters as commander of Operation Desert Storm in 1991, invariably clad in desert camouflage, which he is credited with introducing. Schwarzkopf described the key maneuver that led to the end of the ground war, a redeployment of forces into Iraq behind Iraqi lines, with a boxing metaphor: He called it a "left hook." And he memorably dismissed one report he disagreed with as "bovine scatology." In his 1992 autobiography, "It Doesn't Take a Hero," Schwarzkopf related that he meant to send a message in those briefings. "With those cameras grinding away, I knew I wasn't talking just to friendly audiences, but that Saddam and his bully boys were watching me on CNN in their headquarters," he wrote. "If it had been our intention to take Iraq, if it had been our intention to destroy the country, if it had been our intention to overrun the country, we could have done it unopposed for all intents and purposes from this position at that time." Click to view scenes from the life of the retired Army general. Schwarzkopf emerged from the war with the nickname "Stormin' Norman" and a career in television, much of it as a military analyst for NBC News. The decision to go to war to oust Hussein was the defining moment of Bush's presidency. In a statement from Houston, where he is being treated at Methodist Hospital for complications related to bronchitis, Bush called Schwarzkopf "one of the great military leaders of his generation." "More than that, he was a good and decent man," Bush said. In January 2003, Schwarzkopf said on NBC's TODAY that he thought Bush's son, the 43rd president, had made a "very compelling" case for removing Hussein from power. But by December 2004, he was criticizing Defense Secretary Donald Rumsfeld for his handling of the second war, telling MSNBC that war policy was being controlled by civilians in the Defense Department who "showed a total lack of understanding of the culture that we were dealing with" in Iraq. As a result, he said, "things have gone awry," especially in terms of adequate armored protection for troops on the ground. Dec. 13, 2004: Norman Schwarzkopf tells MSNBC's Chris Matthews that civilians in the Defense Department were mishandling the war in Iraq. In a statement Thursday night, President Barack Obama called Schwarzkopf "an American original." "From his decorated service in Vietnam to the historic liberation of Kuwait and his leadership of United States Central Command, General Schwarzkopf stood tall for the country and Army he loved." Colin Powell, who was Schwarzkopf's boss as chairman of the Joint Chiefs of Staff during Desert Storm, remembered him Thursday as "a great patriot and a great soldier." "He was a good friend of mine, a close buddy," Powell said in a statement. "I will miss him." Schwarzkopf, who had been based in Tampa for many years on the way to leading U.S. Central Command in 1988, was a prominent spokesman for campaigns to promote awareness of prostate cancer, with which he was diagnosed in 1993. He is survived by his wife, Brenda, and their three adult children. Andrea Mitchell and Courtney Kube of NBC News contributed to this report.